On September 11, 2001, United 93 crashed into a field in Pennsylvania. Today, a memorial reminds the terrorist act and its victims. To visit a serious American place, inland, one and a half hours drive from Pittsburgh, in the middle of Pennsylvania, which is no longer part of the East Coast but is not yet the Midwest. Where the green hills roll softly into the landscape, you ski in winter and the ground is baked in the summer. America, inland, Somerset County , 18 minutes&apos; flight from Washington, where on September 11, 2001, a Boeing 757 broke into Newark on the 11th of September, and was on the way to San Francisco Could not stop the resistance of the passengers, brought the plane to a crash: on a field in Shanksville, which was once a pit area and now a grave. For forty passengers and crew members. And four terrorists. A memorial reminds today of the attack. The sky is great here and the view is wide. From the enormous parking lot you reach a dark cobblestone path, which leads like an arrow to the Memorial Plaza, where two walls of concrete intertwine, creating an irresistible, oppressive pull. But this is not an arrow - this route follows the route of Flight 93 on the last meters before the Boeing, kopfüber, hit. It was the last one that fell into the hands of the terrorists on September 11, 2001, and also the last one that crashed. Flight 93 had left Newark late. Passengers who panicked at home to report that their machine had been kidnapped heard of their relatives what was happening at the Twin Towers in Manhattan and the Pentagon Washington. So no bomb, no demands what the terrorists on board of Flight 93 had claimed - the aircraft itself should be the weapon. And the goal, you know today, is the Capitol in Washington. And so the passengers rose to stop the terrorists - and storm the cockpit. "With almost no time to decide," former President Bill Clinton said in his speech, when the memorial was opened on September 10, 2011, "they gave the entire country an incalculable gift." You can look at Clinton&apos;s speech on video, in the information center that tells of that day. A quiet place, like the whole plant is silent: An American flag blowing, park ranger - the plant belongs to the national park service - give short tours, hardly anyone else says a word. This place, in the middle of the vast, vast nowhere of the United States, speaks for itself. In the information center, a man puts a uniform badge on a photograph of the smoking pentagon building, says a few words to himself, goes out. A woman holds one of the telephone hands on the ear, which plays excerpts of those messages that Flight 93 passengers were leaving on the answering machines of their relatives; she cries. In front of a wall, on which all the names of the dead of September 11 are listed, is a small box with handkerchiefs. From here, a path leads down to the crash site, a three-quarter mile away. It is locked up, only the relatives of the victims, whose mortal remains have here forever mixed with the earth, may go to the place. In the past six years, volunteers have planted ninety thousand trees on the site, one hundred and fifty thousand. 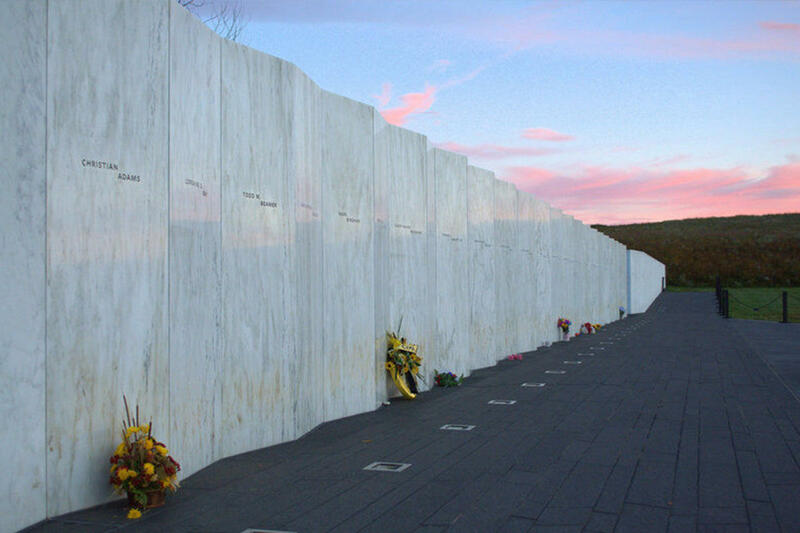 Next September, there will be a tower, with forty winds for the victims of Flight 93.